Universal Audio UAD-2 Sale! 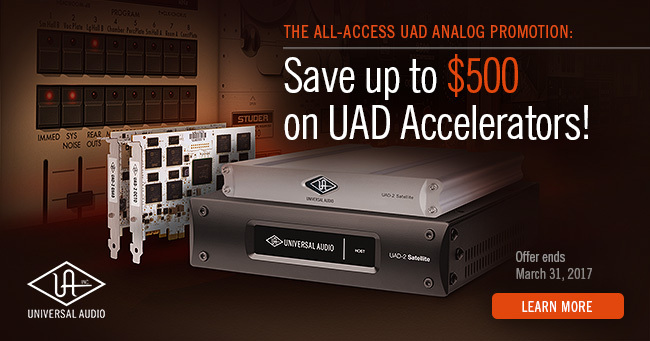 Save up to $500 on UAD-2 DSP Accelerators! Save up to $500 / €500 / £425! Save up to $300 / €300 / £255! Save up to $500 on UAD-2 DSP Accelerators! Hurry, ends March 31st, 2017! Looking to start mixing with the authentic sound of analog? Then you won’t want to miss this special promotion. Save big on UAD-2 DSP Accelerators through March 31st, 2017 — and inject rich, three-dimensional “out-of-the-box” analog sound to your in-the-box mixes. UAD plug-ins faithfully capture the sound and behavior of classic analog equipment from Neve,® Studer,® Ampex,® API,® Fender,® and more. Powered by UAD-2 DSP Accelerator hardware for Mac and PC, you get classic studio sound that would be impossible to achieve with native recording systems. With UAD Powered Plug-Ins, the actual processing is offloaded to UAD-2 hardware. This frees up your computer to do other things, like mixing audio and running samplers or soft synths. All UAD-2 DSP Accelerator packages come with UA’s Analog Classics Plus plug-in bundle. Shop UAD-2 Now and save big on the classic analog sound of Universal Audio UAD-2 Powered Processors. Offer valid only for customers who purchase any UAD-2 DSP Accelerator card (PCIe, Satellite Thunderbolt, Satellite USB, or Satellite FireWire) package (Core, Custom, or Ultimate) from an authorized UA retailer between January 1st and March 31st, 2017.